We’ve been working to insure that Mister D: A Children’s Picture Book about Overcoming Doubts and Fears is able to reach even more readers. As of April 28, 2013, after multiple requests from teachers and librarians, the book is available in paperback. 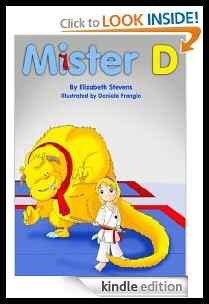 Mister D is also now available as an e-book on Kindle Select. Mister D is available in hardcover, as well. Mister D has been approved for use in California public schools by the office of California’s State Superintendent of Public Instruction. Elizabeth recently completed a children’s play (six acts) based on Mister D.